Zune data recovery software recovers all lost deleted corrupted music files and folders from your zune social network player. This easy and safe utility recovers video sample tracks songs and folders lost due to human error or any virus generated data loss. The software restores lost music mp3 due to accidental deletion, corruption, format, improper handling and damaged file system from your digital media player. The music recovery software support all major zune storage drives and recovers lost music, video, pictures, songs, captured snaps and all other previously existing data on your portable digital music player. This easy to use music recovery software easily finds and provide thumbnail preview of the complete recovery. Complete support to all lost music recovery. Data Recovery lost due to zune to zune wireless sharing. 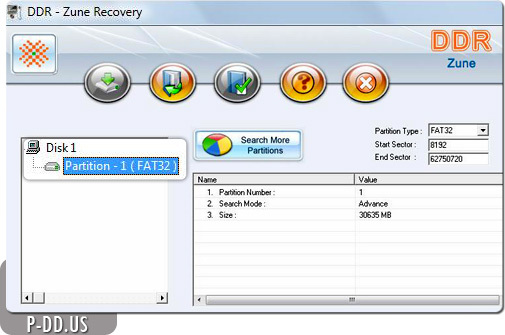 Lost recovery due to human error or any virus generated data loss. Complete recovery when any error message is displayed when accessing your zune drive in My Computer. Very easy to use zune recovery software (no technical skills required).